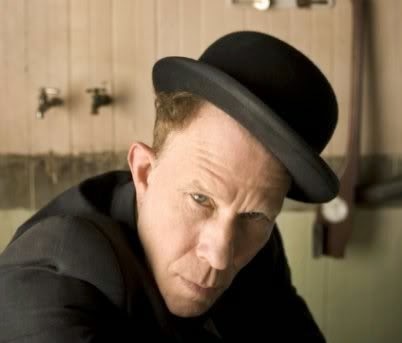 Gothic and poignant, grotesque and sublime, Tom Waits envisages characters and stories through song like a seasoned author does in literature. Before an audience nearing 3,000 on Tuesday night at the Moran Theatre in Jacksonville, Florida—his first-ever appearance in the city—the iconic artist rendered his distinctive creations with a masterful, 27-song performance. His 5-piece band discreetly arced around him, Waits took to a riser at center stage, stomping plumes of dust in the air as he began with “Lucinda,” which segued into “Ain’t Going Down To The Well.” Following a rambunctious “Way Down In The Hole” (propelled by his oldest son, Casey, on drums), he delved into “Falling Down,” his cavernous voice booming at full force. He tinkers with the setlist from night to night, yet Waits isn’t one to take requests from the crowd, despite persistent (and vociferous) calls to do so. “We’ll play all your favorites,” he quipped like a vaudevillian master of ceremonies in a futile attempt to calm the maelstrom. For a man notorious for his gruff voice and peculiar, scrapyard-sound arrangements, Waits delivered an assortment of ballads that ultimately proved among the finest performances of the night. On songs like “Anywhere I Lay My Head,” “Cold Cold Ground” (featuring keyboardist Patrick Warren on accordion), and “House Where Nobody Lives” (with his youngest son, Sullivan, on “assistant clarinet”), Waits exhibited cinematic breadth and magnificence. In doing so, he captivated the audience not just with the brilliant idiosyncrasies of his music, but also with the craft with which he invests it.